the new artist-id cards are ready for pic-up. 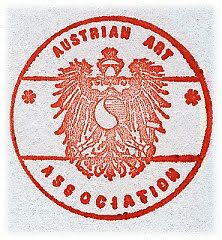 the new card shows the title "artist document of identification" or "künstlerausweis" and no more "membership card", like it was before. The cards come in english/german with a complete new design. It is our pleasure to contact you on recommendation from Ms Angelica Tomic of Austrian Cultural Forum in Belgrade. Belgrade) last year initiated an artistic colony named The Boat which was dedicated to the artistic interpretation of landscape and scenery. The first colony's topic was the confluence of Sava and Dunav in Belgrade. The Boat colony gathered over twenty artists: sculptors, painters, photographers and multimedia artists. The colony was an instant success and one of the best in the country straightaway, particularly after a member of the Serbian Academy of Science and Arts participated alongside 10 painters with a master degree, three Fine Arts photographers and three Academy sculptors. The event was well publicised in the press and electronic media. The colony also yielded seven exhibitions in various cities of Serbia. The colony continues its work with its second installment this summer. 25 km north of Belgrade). In July this year Ms Angelica Tomic of the Austrian Cultural Forum went to one of the exhibitions in the National Museum in Kragujevac and suggested a cooperation. We are contacting you regarding this cooperation. photographer) from Austria participate in the 2017 colony, if they are interested of course. Travel and accommodation expenses as well as the working material costs would be covered by the Austrian Cultural Forum from Belgrade. Ms Tomic also suggested that we should get in touch with one of Austrian art associations in order to get in touch with artists that would potentially be interested to come to the 2017 colony. With that in mind, it is our pleasure to contact you with hope that you can help us with regards to recommending the three artists that would be willing to participate in our colony next year. If you are interested in our proposal, please let us know. We would like to sign a non-binding memorandum of cooperation that would include the names of the three artists, which we would then forward to the Austrian Cultural Forum as the first step towards their participation next year. If there are any additional details you would like to know, please do not hesitate to get in touch. BAUCHREDEN LERNEN mit Spaß: Intensivkurs vom 17.09.-18.09.2016mit Perry Paul. Perry ist einer der gefragtesten Bauchredner Deutschland"s und ist seit mehr als 30 Jahren als Profi tätig. Im kleinen Kreis führt er Sie in die Kunst des Bauchredens ein. In seinem privaten Bauchrednerstudio gibt er seine ganze Erfahrung weiter. Sie erlernen seine spezielle Sprechtechnik und Puppenführung. Ebenfalls zeigt er Ihnen einfache, aber äußest humorvolle Kurzdialoge und Spielsequenzen auch im Zusammenhang mit Zauberkunststücken. Der Kurs findet in 86381 Krumbach statt. Sachkundige Aufsichtspersonen und Veranstaltungsleitung - Nächster Termin 27. bis 29. Juni 2016 - jetzt anmelden unter service(at)avb-akademie.de -------------------------------------------------------------------------------------------------------------------------------Führen Sie Veranstaltungen durch, die Organisation und Verantwortung liegt in Ihren Händen. Kennen Sie die Vorschriften zu Fluchtwegen, Brandschutz, Evakuierung. Dies und viele weitere Themen stehen bei diesem Seminar auf dem Programm. Die nächsten KultNet Kultur Ausschreibungen & Fortbildungsangebote werden zum 15. Juni 2016 wieder an über 26.000 Abonnenten versendet.